We're often asked for help in how to reward employees, either to try to encourage and motivate even more active contribution from them, or just to appropriately reward the ones that have actually been active and contributed to the success of the organization. These are actually very good questions. Obviously you'd like to do something to show that you really appreciate the effort of your employees and do care for them, but choosing the right reward usually isn't easy or straightforward. To be able to answer these questions, we usually advice the person to first take a step back and try to understand what it really is that makes their employees tick – the sources of employee motivation. There's plenty of great literature on the topic but my personal favorite is Herzberg's Two-factor theory, also known as the motivation-hygiene theory. The theory has a lot in common with the earlier work of Maslow's Hierarchy of Needs in that both claim that people won't, in the long run, be motivated just by external aspects of the job, such as pay or job security. Herzberg, however, figured out that the factors that really motivate and satisfy a person in a job are not the same as the factors leading to dissatisfaction, referred to as the hygiene factors. In essence, an employee will be reasonably satisfied if the hygiene factors, such as job security and a nice salary, are in place but that alone doesn't guarantee motivation. On the other hand, even a dissatisfied employee might, in some cases, be highly motivated despite the hygiene factors not being in order. Each person weighs these factors differently based on their individual personality and current state of life. The real challenge lies in the way each person weighs these factors differently based on their individual personality and current state of life. For example, younger people typically value opportunities for personal growth more than people further on in their careers, whereas older people put more emphasis on the intrinsic qualities of the job itself, as well as their own health. Some people are also inherently more motivated by advancement and responsibility, whereas some are driven more by the purpose of their job. Each manager thus faces a difficult challenge. They need to not only understand how each of their employees weighs these factors, but also support the individual aspirations of each person on the day-to-day of their jobs. Based on these two categories of factors, there are four basic scenarios one might find themselves in. Let's now look at each of these scenarios representing a different workplace and think about the areas the company should focus in order to be able to achieve a position where every employee is both highly satisfied with their job and motivated to do the very best they can for the company. This is obviously the worst case scenario with the workplace being low on both hygiene and motivation factors. In this case, the employees are most likely underpaid, have very tedious jobs with little room for freedom or creativity. They are also subject to poor facilities, as well as tons of corporate policies and strict supervision. This means that there's no room for exceeding expectations or receiving recognition beyond being able to do the bare minimum required of the employee. At least in my experience, there are very few companies that can be classified as categorically being in this quadrant of the matrix. However, there are surprisingly many companies where a certain department or departments are in a situation at least resembling this. This idea is very much in line with Maslow's Hierarchy of Needs. A person must first have all the necessities like food and shelter (and Wi-Fi!) covered before they can move up the pyramid and focus on other things. So start off by improving the hygiene factors that your employees are currently finding the most disturbing. Then, once those are in reasonably good shape, you can gradually start to introduce elements in people's jobs that lead to their jobs having more of the aforementioned motivational factors, such as responsibility and opportunities for growth. Don't be discouraged if change seems hard at first, it always takes time. 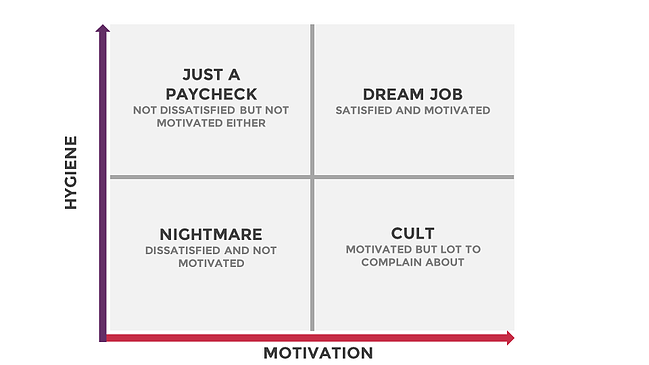 This quadrant of the matrix is defined as being high on hygiene factors but low on motivation ones. This is probably the most common scenario in white-collar jobs. From the outside, everything seems to be great. There's a nice office, fancy titles and good salaries. Yet, even with all of these niceties, people just don't seem to go beyond their job description, let alone that infamous "extra mile". In this case, the majority of the hygiene factors are already in good order so you can start to focus on enabling motivation even though here most likely are still some lingering challenges regarding the hygiene issues of corporate policies, supervision, or relationships that still need some work. These, however, are usually alleviated by introducing employees to more freedom and responsibility and transforming towards a more coaching oriented management style to support the new approach. But to cope with the increased freedom and responsibility, there's usually a need for strong leadership to ensure that everyone is actually working to accomplish the same goals. A clear vision and increased transparency to the rationale behind why certain strategic decisions are made already goes a long way to accomplish this. In the dictionary, a cult is referred to as "a situation in which people admire and care about something or someone very much or too much", which is very characteristics of the organizations in this part of the matrix. They are lacking in many of the basic hygiene factors but compensate for that with very strong motivational factors. If you find yourself here, you're most likely in a startup with a grand vision for a better tomorrow. Inspiration and a sense of comradery are incredibly powerful assets, which alone are often enough to make people go to incredible lengths and might even forgo their material needs, at least for a while. So if you've managed to create this kind of an atmosphere, you've already managed to get the hard things right with a very engaged culture and great leadership. Now you just need to make sure that you're in the game for the long haul by really taking care of the long-term wellbeing of the people that work for you, not just exploiting them in pursuit of that grand vision. By now, it's probably clear that if you've got both the hygiene and motivation factors in place, your people will be satisfied and motivated, the characteristics of a dream job. Even if you are here today, you still need to continuously improve on all of these factors to ensure that the situation keeps moving in the right direction. If you don't, you'll inevitably start to move back in the wrong direction once your operating environment changes or people just run out of room for growth. This is exactly what's happened to most organizations that today are no longer engaging places to be in. They too were usually exciting places to work at prior to these issues being forgotten in the organization. 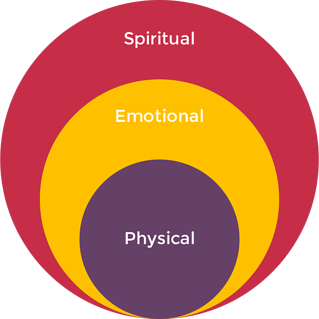 As cliché as it sounds, in order to really motivate your employees, you'll need to take a holistic approach that fulfills their needs and desires on all levels: physical, emotional and spiritual. While all of this is in theory relatively straightforward, it's incredibly difficult to do in reality. First of all, you'll need great leadership from top management, both in terms of creating a purpose for the organization, as well as providing support for the change initiative. But the real challenge lies in making sure that all of your managers are able to rise to the challenge and can enable motivational factors in the way they manage their teams on a day-to-day basis while taking into account the unique desires of each employee. Which brings us back to our initial question of how to reward employees. The short story is that simplistic external rewards won't really motivate people, at least in the long run, and might even be harmful. The best you can do to motivate your employees is to support them to find their inner motivation. The best you can do to motivate employees is to support them to find their inner motivation. So for example, if an employee comes up with an idea that they're very enthusiastic about and that seems very promising from the company's point-of-view, you could reward the person by letting them transfer to the project where the idea is to be implemented. We'll discuss practical examples of rewarding employees more in a later post so make sure to subscribe if you'd like to keep posted.